Fitness, food and loving life! The importance of taking progress pictures! 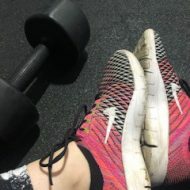 Posted byanothergymgirl	 December 16, 2018 Leave a comment on The importance of taking progress pictures! For the majority of my life, I have been focused on my weight. The number on the scales was the only way I had of measuring progress, and truthfully, measuring my worth. But I cheated myself. If I knew I had binged, or eaten big meals and done no exercise, then I wouldn’t weigh myself. I knew the number would go up, but I managed to convince myself that if I didn’t actually weigh myself and didn’t actually see the number going up, then it wasn’t really going up. Silly, right? But I talk to so many friends, and they say the same thing. And in reality, while weighing yourself is a valid way of tracking fat loss, it it certainly not the only way. I have learnt that it is simply one way of measuring, to be used in conjunction with others. So now, I still weigh myself (yes, even if I’ve had a ‘bad’ week, the number can still change whether I look or not! ), but I also measure different parts of my body by centimetres, and I take progress pictures. And that is the subject of my post today: progress pictures! When I began working with my PT and she told me I needed to be taking them every week, I was filled with dread. I mean, I hated having my photo taken so the thought of having to religiously take my photo every week was awful. But I knew that I had to leap into this process if it was going to work. The first pictures I took felt horrible, I still don’t love taking them. But what they have allowed me to do is compare how I looked before, to how I look now. It has allowed me to see the progress I have made. It is a reminder if I look at myself now, and still feel unhappy, that I have come a long way! The photos above are 1 year apart. It makes me feel very proud of myself to see how much my body has changed due to the hard work I have put in – and if I didn’t have the picture on the left (one that I hated taking) then I wouldn’t be able t see the progress in the picture on the right. My progress pictures are some of the most important tools to keep me going on my journey. And I would encourage anyone else to do the same – let yourself see how far you have come. Another Gym Girl, Blog at WordPress.com.